Grillz have been spotted back in the 1980s with rappers in the North representing them. Gold teeth are popular in all shapes and sizes and some members of the Wu Tang Clan have been seen with fang-like grillz to represent their legendary group’s logo. Slowly, the grills style seemed to fade, but it rapidly made a comeback in the 90s with more designs and more sparkle. Many people know about Nelly’s hit song “Grillz” and the style became more popular when his song was released. As many other celebrities contributed, such as Alli & Gipp, Nelly, and Paul Wall, there is one name that needs to be recognized in influencing the Grammy nominated collaboration: Johnny Dang. In Nelly’s music video, there have been claims that Johnny Dang made a cameo in the video, and he has also been on stage with Paul Wall during performances of the popular song. While Johnny Dang is not a celebrity like Beyonce or Jay Z, he is an important figure to embrace the gold grillz phenomenon. Johnny Dang stands behind the sparkled diamond grills in the mouths of celebrities and has established so much more. He is known as “the jeweler to the stars.” He is someone who has worked hard from the bottom up, and although he is still in this industry, his hard work has paid off. Johnny Dang first immigrated to America from Vietnam in the 90s, and upon arrival, he immediately began working as a watch repair technician to begin his career. He worked out of his car and also rented a small space at a local flea market. It wasn’t until several years after he first came to America that his business skyrocketed and became known once he worked together with Paul Wall in 2000. Then, once Nelly’s song “Grillz” was released, the number of items that Johnny sold was over 400 a day, with each one priced at approximately several thousands of dollars. He has now opened two stores with both locations in Sharpstown Mall in Houston, Texas. His popularity and business has soared so that it forced the neighboring competitors, such as Zales, to close their doors. His stores are flooded every day from celebrities, to out-of-towners, and window shoppers. While people may not have recognized the name Johnny Dang in the beginning, his name is becoming much more recognizable more than ever. Johnny has been in the spotlight since he became known after Nelly’s “Grillz”, and now he services Hollywood A-listers such as Kanye West and Lil Wayne. But Johnny Dang does not only service grills. No matter what type of activity you are into, whether it is hip hop, rap, athletics, or the high society, Johnny can get you anything that you need from jewelry and watches- at the best price. However, just because he works with celebrities and top stars doesn’t mean that he discriminates his customers by status. Whether a celebrity or a commoner, Johnny treats all of his customers equally. Just because someone has a lot more money, he does not charge them more. He once shared, “You shouldn’t charge someone more just because they’re famous.” In addition, he is very knowledgeable with his products and manufacture and uses the highest quality materials while charging a fair cost. Because the quality is high and the prices are fair, people have reportedly been returning to Johnny. During recent years, Johnny has not only been creating the best jewelry pieces, but he has also been up to a hyped up publicity stunt that attracts the media from all sides of the spectrum. For example, Johnny Dang and Paul Wall had Olympic swimmer Ryan Lochte sport their stars and stripes design in front of the global audience to represent America. Because of their success with Ryan Lochte, the duo decided to contact Kobe Bryant, a famous basketball athlete of the LA Lakers, in 2012. However, the offer to sport a grill of his choice had a condition. Bryant had to lead Team USA’s men’s basketball team to a gold medal in order to get the grill he wanted, and Paul Wall had some ideas such as yellow gold with purple diamonds to represent the Lakers. In another example, the grill creating duo told customers who buy a watch a week before the 2014 NBA All-Star Game in New Orleans that they would promise to provide a full refund on the purchased watch if their team loses. Ultimately, if the duo’s team lost, they would have to refund a whooping $200,000, but Johnny Dang said that the amount of publicity and watches that sold there after resulted in a net gain for the company. Although that is a huge chunk of money for some businesses to lose, Johnny worked hard to create the company that he did. Celebrities loved him to give him shout outs in their songs and even appear in several music videos or perform on stage with clients. Whether Johnny Dang is on the red carpet with the high society celebrities or performing in hip hop and rap music videos, he has the look and personality that stands out wherever he goes. He fits right in into whatever project he is working on by looking bold, and doesn’t restrain himself to only urban circles. His jewelry is being sported by a wide range of stars such as Paris Hilton, Nelly, Hugh Heffner, P. Diddy, Ryan Lochte, Lebron James, and Kanye West. 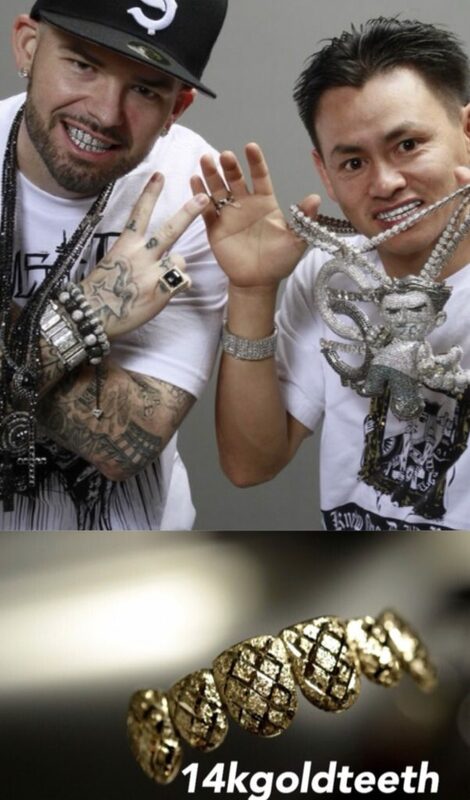 Johnny Dang has specialized in the hip hop jewelry industry that if you ask Travis Scott, Beyonce, Jay Z, Lil Jon, or other big hip hop stars, they will no doubt recommend you to Johnny Dang. Whether you are looking for watches, grillz, or even engagement rings, you can find everything that you need in the highest quality at the best price, and you can guarantee that Johnny’s products will shine bright like a diamond. If you don’t see exactly what you like, Johnny can customize it for you and it’s manufactured in the house at their high technology jewelry workshop and repair facility. While he may have started from the bottom up, Johnny Dang has single handedly influenced and changed the way entertainers, rappers, hip hop artists, and other celebrities wear their jewelry today.